Core business for Parmakit is the design and manufacture of alloy cylinders – we were one of the first to experiment with and develop new technologies, manufacturing techniques and materials for alloy cylinders. 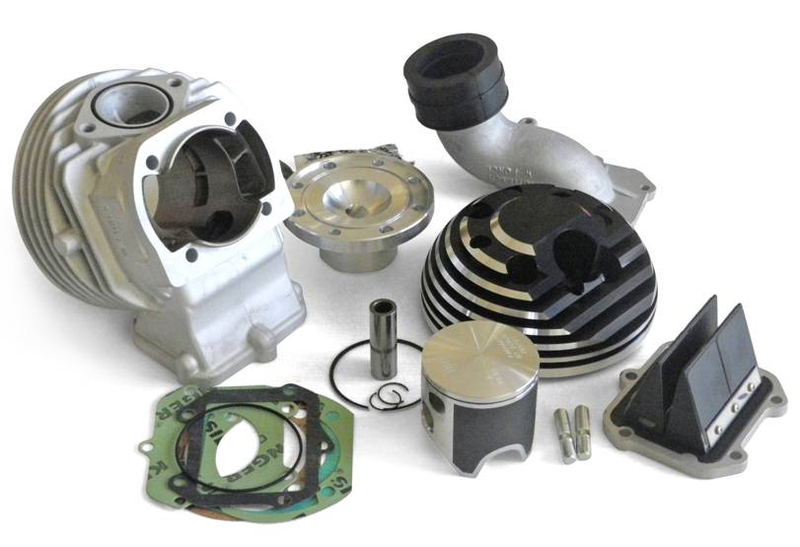 Over the years the company has created a thorough and highly specialised processing cycle, such as gravity-fed foundry, CNC machining, durable nickel- silicon lining on the cylinder bore and more. Our main goal has always been the customer satisfaction, therefore we have always endevoured to develop products that would meet the various needs of our customers. With this goal in mind we have created more than 50 brands on the market, with over 5,000 products in its range.
. The first is dedicated to Speed lovers with its alloy Thermic Units and specific for race, bench-tested to get the best performance. · The second is aimed to more quiet customers who are looking for a spare part to the original or for something to reach a better performance but not over the top, this is the cast iron line. For both we added a series of other components, such as crankshafts, feeding units, eletronic ignictions, geners, etc, designed to match with our Thermic Units. All these conditions and the quality of the products give to PARMAKIT a highly professional reputation in this field. In addition Parmakit participates and organizes races on the track and off-piste both in Italy and in Europe with its own vehicles and teams. Fill in the contact form, our expert staff will answer you as soon as possible.